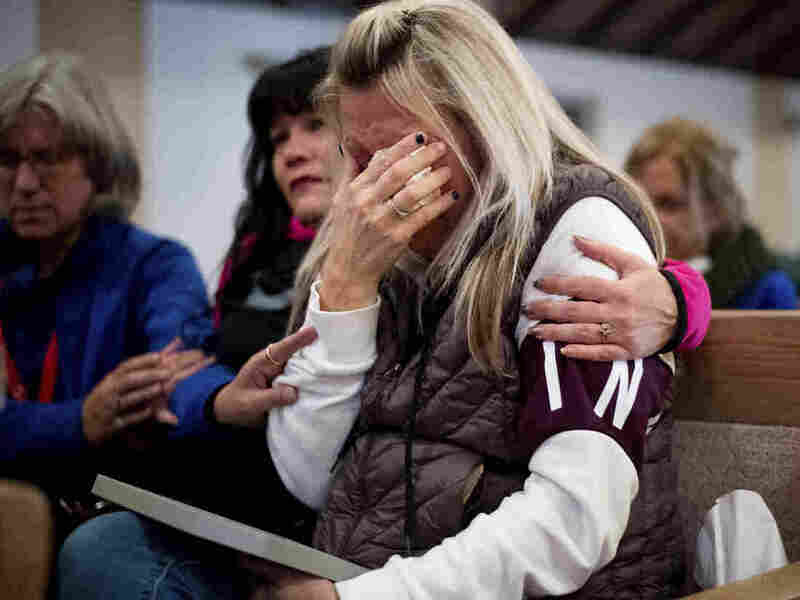 California Camp Fire Death Toll Reaches 83, Fire Authorities Say Rain arrived on Wednesday aiding containment efforts, but it may also hamper the search for human remains. Laura Martin mourns her father, TK Huff, who died during the Camp Fire, during a vigil on Sunday in Chico, Calif. The death toll as a result of the Camp Fire in northern California now stands at 83, after local authorities said that two more sets of human remains were found Wednesday. According to the Butte County Sheriff's Department, 563 people remain unaccounted for. That's 307 fewer than on Tuesday. The Camp Fire has burned more than 153,000 acres and is 85 percent contained, according the latest Cal Fire incident update. The blaze, California's deadliest and most destructive, has destroyed more than 13,000 residences, as well as 514 commercial structures and more than 4,000 other buildings. More than 2,000 firefighters are fighting the blaze. "Moderate to heavy rain is forecasted over the fire area from this morning into Saturday. Established containment lines are holding and firefighters continue work to construct and reinforce direct and indirect control lines to increase containment. Crews continue to patrol the fire area to extinguish hot spots." The steady rain fell over Northern California Wednesday was welcome news for fire-fighting efforts. But it may also complicate the search for human remains by potentially washing away evidence of bodies of fire victims still listed as missing. As NPR's Leila Fadel reports, the city of Paradise that was largely destroyed by the fire is preparing for dozens of funerals. "Eric Smith has a list in the leather-bound portfolio he carries around with him. It's the list of the families waiting to bury their loved one when the bodies are released from the Coroner's office. "He manages the Scheer Memorial Chapel in Oroville and the Rose Chapel Mortuary and Crematory in neighboring Paradise, California, which miraculously still stands. "We don't know how long it'll be. I mean they'll be still people on the missing list probably it will never be found. So people are calling trying to find out. People want to know. They want to know if a person has been identified. If we know if they've been identified." In southern California, the Woolsey fire in Los Angeles and Ventura counties has burned more than 96,000 acres and is 100 percent contained. Three people died in that fire. Taken together, the Camp Fire and Woolsey Fire have claimed a total of 86 lives.